I made this cake over the 4th of July holiday this year. 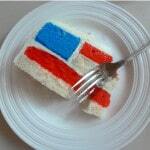 Of course, it is now wayyyy past July 4th, so I am officially calling this a “Team USA” cake in celebration of the US teams at the 2012 Olympic Games. I was really surprised at how well it turned out since I haven’t baked many layer cakes in the past. Most of my prior cakes have been fairly straightforward, and I was less concerned about the appearance and more interested in the taste itself. These days, I’m trying to improve on how they look in addition to how they taste. I can’t recall how I first came across this cake. The original creator, Elissa, blogs at a site called 17 and Baking. Although Elissa created the cake design, I opted to use a recipe from a site called Secret Life of a Chef’s Wife. My family and I really loved the flavor of this cake – I’m craving a slice right now!! Definitely a keeper!! You will need to prepare the cake recipe below twice (or whatever your favorite recipe is for two 8- or 9-inch layer cakes) and you will need plenty of frosting (cream cheese frosting recipe here works well). After you mix the cake batter, you will divide your batter into two equal portions. Using the first batch, tint one part blue, and another part red. You will leave the second batch all white but only use half of the batter (can use the remainder for cupcakes, or a plan layer cake). After the cakes have been baked and cooled, you begin the assembly by slicing the red cake and the white cake horizontally with a long serrated knife – leave the blue cake in tact for now. It helps greatly if you refrigerate or slightly freeze your cake layers before cutting so that the cuts are cleaner and the cake doesn’t fall apart when lifting. 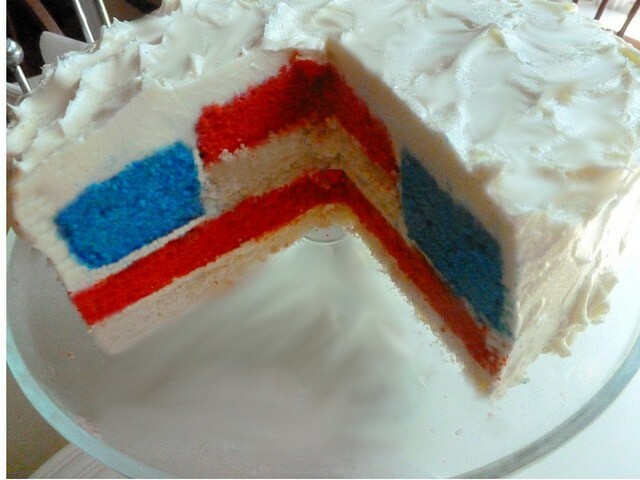 After the white and red cakes are cut, you should have 2 layers of red, 2 layers of white, and a single thick layer of blue (ie, blue is uncut cake). I began by assembling the top half of the cake (the blue with the smaller red and white stripes). Do create the top, stack one of the white layers followed by one of the red layers, and top it off with the entire blue cake, ensuring that they are all aligned as best as possible. Then, using a 5-inch circular template (a plastic lid, dish, or other circular object) (I think I used the top of a shortening can), cut around the circle, through all three colors. You will end up using the outside of the blue layer (large “doughnut” circle of blue), and the inside of the red and white layers only (ie, small circles of white and red). 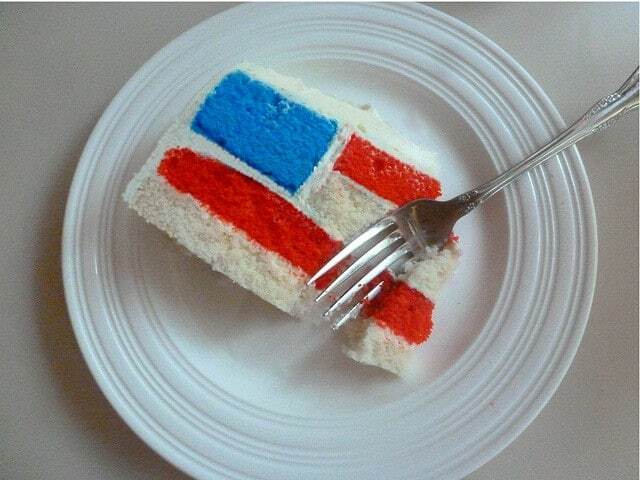 You will not use the small inner blue circle and the outer red and white circles in this cake. To continue creating the top half, spread a very thin layer of frosting along the inner edge of the blue cake ring, and carefully insert the small white circle. Then, spread another thin layer of frosting on top of the white layer and place the small red circle on top. Set this aside for now. To create the final cake, stack the remaining white layer on your cake board or cake dish and top with a generous amount of frosting. Stack the remaining red layer on top and spread a generous amount frosting on top. Top this with the top half of the cake, assembled in the previous step. Finish by frosting the entire cake. NOTE: Smitten kitchen gives many great tips for storing and slicing layer cakes. For example, freezing or refrigerating the cakes is essential to ensure that your cuts are clean. Reviewing the information from her site really helped me. Also, I used cake strips to ensure that the layers baked evenly and I didn’t have to level my layers at all. 1. After baking and cooling, wrap your cakes tightly in plastic wrap, then freeze or refrigerate them before cutting. 2. Use a flat cookie sheet to move and lift cake layers. 3. Dip your knife in hot water and wipe dry before cutting each layer. 4. Do not over beat the batter, as it may deflate and cause the cake to become less airy. Cream together butter and shortening until light in color and well incorporated. Add the baking powder, sugar, flavorings, and salt and continue to beat for another minute. Ensure that the batter is no over beaten so the batter does not become deflated. Bake until the layers spring back lightly to the touch and the layers just begin to pull away from the sides, about 27 to 32 minutes. After cooling on a wire rack for 10 minutes, refrigerate and follow cake assembly instructions. It woudl be great if you could add photos to your tips or steps suggestions as it would allow your readers to actually see what you are saying! Thanks for the suggestion! I’d love to add step by step photos…will have to wait until next year for another flag cake, but there are so many others that I want to try!